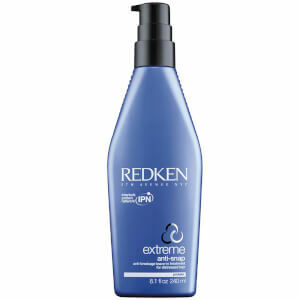 Treat your distressed or weakened hair to this Redken Extreme +1 Repair Pack (3 products) Bundle. The complementary products boasted by this bundle work in unison to resurface and strengthen distressed hair, fortifying it so that it looks and feels healthier. Redken's collection of scientifically advanced hair products ensure that your hair is left hydrated, more manageable and shining with health. The exclusive Interbond Conditioning System contained within these products delivers a unique 3D Repair Complex to fortify your hair, making it up to four times stronger. This deeply nourishing Redken shampoo works to cleanse and repair dry or damaged hair, leaving it supple and manageable. Treat your hair to this creamy conditioner that smooths cuticles, revitalises hair, detangles your damaged locks and eases wet combing. This intensive hair treatment nourishes your hair with proteins and ceramide to soften and add an instant shine. Active ingredients work to replenish the ideal levels of moisture held by your tresses, for hair that gleams with health.